1. In a medium saucepan, bring the stock and pears to a boil over medium-high heat. Reduce the heat to medium, cover and cook until the pears are tender, about 8 minutes. Stir in the red-pepper flakes and remove the saucepan from the heat. 2. In the bowl of a food processor, blend the pears and stock until smooth. Pass the soup through a fine-mesh strainer into a medium bowl. Stir in the Champagne, lemon zest and lemon juice. Season to taste with salt and pepper. 3. 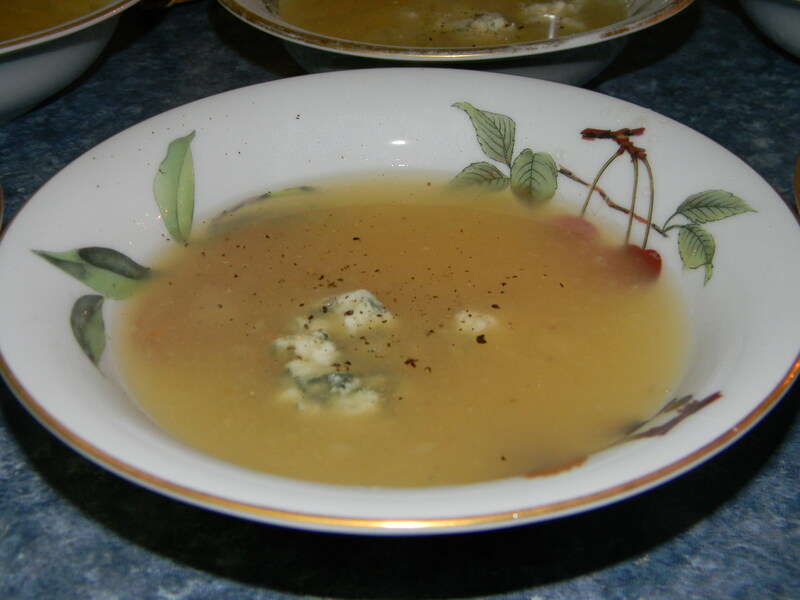 Divide the soup among 4 shallow bowls and garnish with the blue cheese. Serve immediately. (The original recipe also calls for garnishing with celery leaves, but we didn’t use those when we made it). *We used pears from the pear tree at Sweet Springs, and we have no idea what kind of pears they were, but we just know they were delicious. This recipe is from a Tasting Table email (which, by the way, you should sign up for). They say the recipe is adapted from Dirk Flanigan, Henri, Chicago. This goes on my top 5 list of most unique recipes I’ve ever seen! Good for you to try it! !